Midfielder Colin Ryan says the Banner are in the right hands ahead of tomorrow’s All-Ireland semi-final against Limerick. DAVY FITZGERALD’S TACTICS give Clare their best shot at winning, Colin Ryan said as he brushed off concerns that the manager’s system is stifling his rising stars. Since disappointing against Cork in the provincial semis, the Banner have gone from strength to strength and won three in a row to set up tomorrow’s All-Ireland semi-final against Limerick. Podge Collins, Tony Kelly and Colm Galvin have all played themselves into contention to be named Young Hurler of the Year while Ryan, Brendan Bugler and Conor McGrath will surely feature in the All-Star discussion at the end of the summer. At the helm Davy Fitz is pulling the strings and midfielder Ryan said the squad has complete faith in their boss. 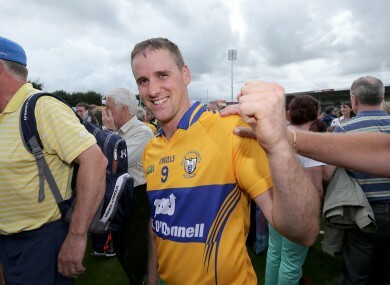 “Davy is a passionate Clareman and I am under no illusion that Davy wants Clare to win. We all have the same common goal, the players and management, and he is doing everything possible to make that possible for us. At the end of the day that is exactly what I want from a manager. He is a great person, a great leader and it is great to have him on our side. Clare’s approach, based on pace and a short passing game, has garnered plenty of plaudits this summer but Fitzgerald’s critics believe he’s not allowing his team the freedom to express themselves. “People can say what they like,” Ryan continued. “Davy goes out and sets us up in a way that we can try and win. At the end of the day we all believe in that. “Listen, they said Jim McGuinness was wrong until he went and won an All-Ireland. It changes very much when you win and we are going out to win and that is exactly what we want to do. You can’t tie down those young lads. You can’t tell them to hurl in a specific way. I am sure he did not tell Podge Collins to handpass the ball behind his back [against Galway]. The lads go out and hurl with freedom. Fair enough, there are systems in place but at the end of the day when you have the ball and you are trying to score, you have to make decisions yourself on the field. He gives us the opportunity to do that. Email “Colin Ryan on Clare’s tactics — ‘Davy Fitz didn’t tell Podge to handpass behind his back’”. Feedback on “Colin Ryan on Clare’s tactics — ‘Davy Fitz didn’t tell Podge to handpass behind his back’”.